How Herschel backpacks became ubiquitous. The making of the now-ubiquitous heritage backpack brand. Herschel’s Little America backpack combines rustic elements with clean, urban design. Photo illustration by Slate. Photos by Herschel. You’ve seen them around; you can’t help but see them around. On street corners, in crowded subway cars, at a sun-drenched café table. In the past few years, bags from Herschel Supply Co. have turned up all over, inviting you and everyone you know to walk that razor’s edge between trendy and rugged. Since the company’s founding in 2009, the Herschel backpack has grown into a global phenomenon, glimpsed wherever hipsters dare to tread. Herschel targets what it calls the 18-to-35-year-old “travel consumer,” and it’s done so masterfully. What is it about these bags? Why can’t I walk a Brooklyn block without running into the old-timey logo, boasting of “the finest quality” in a font that makes me wistful for a gold rush? I decided to take the brand’s best-seller out for a drive. 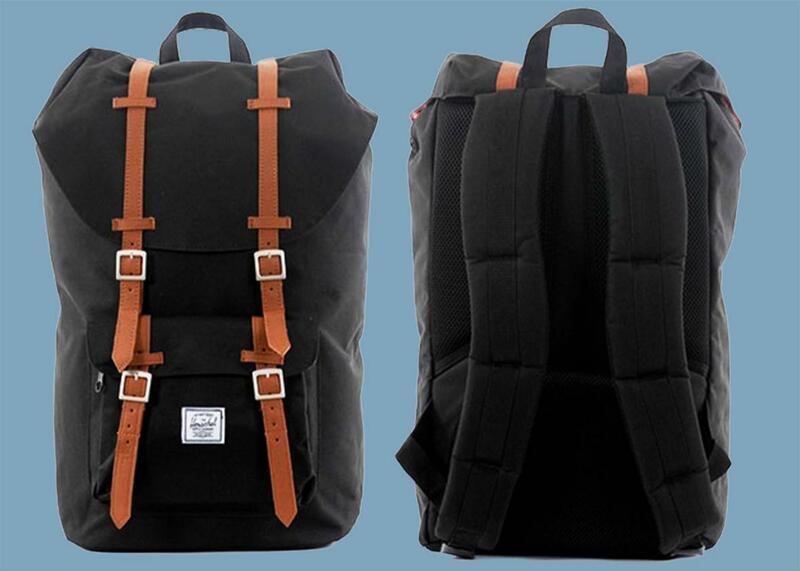 Herschel now has 40 backpack models in a wide range of colors and styles. The Little America, as shown here in black with brown accents, is the company’s most popular bag. It’s a one-compartment, top-loading daypack that closes with a drawstring and a flap cover. You can secure it with magnetic clasps hidden underneath the synthetic leather straps, which are the bag’s most noticeable (and retro) feature. There is a small front pocket, and inside the main compartment are two small side pockets and a raised laptop sleeve with a soft lining. The bag stands 19.5 inches tall, giving it a fairly sizeable profile. As a longtime user of a very untrendy L.L. Bean student backpack, I was excited to throw the Herschel over my shoulders and see how it would change my life. I took it all around town, used it for weekend trips and business trips, made it my carry-on while flying internationally, and put it through all manner of day-to-day tests. When it comes to Herschel’s success, I found, branding is the first and last word. The frères Cormack built their company around a carefully constructed nostalgia. Herschel is named after Herschel, Saskatchewan (population: 30), where the founders’ great-grandparents settled in 1906. “The underlying idea … arose from the concept of the towns’ general store, rolling hills, dirt roads … and overall utilitarian feel,” Lyndon Cormack told GQ in 2012. The brand has woven a mythology around small-town authenticity and homegrown quality, even though the products are largely manufactured in China. If the product itself is meant to evoke the North American past, the consumer is encouraged to use it in the global present: The Cormacks have crafted a brand story rich in global adventure, helped by a robust Instagram presence and an ongoing series of travelogues with lush photography on their blog. “The idea for our brand is to really modernize nostalgic product,” says Mikey Scott, Herschel’s global marketing director. The company does this by combining rustic elements (the buckles, flap-covered rucksack style, the stitched logo badge) with clean, urban design (flat, tapered panels and the sleek look of a work backpack). But nostalgia is, at its root, about homesickness; Herschel’s method has been to generate wistfulness for a home that neither the brand nor its city-dwelling-hipster core clientele ever had. With all of that in mind, I started throwing all my belongings into the Little America to see how it handled my carrying life. A 25-liter capacity is a decent size, though I often found myself wishing for a little more space. (Among daypacks, 30 liters is reasonable to heft and ensures you’ll fit in everything you might need.) I had hoped that I could make the Little America my go-to for all sorts of short travel. When I took it upstate for a weekend, I fit my laptop, running shoes, and two days’ clothes inside, but there wasn’t room for any books or other items; I had to schlep a canvas bag as well. Loosening the buckles gives a little more leeway, but not too much. Top-loading bags are ideal for hikers because they’re lightweight, but they’re a nuisance when it comes to everyday use in town, at school, or at the office. As opposed to panel-loading bag designs, which let you pull out the items you want without emptying the whole bag, top-loaders force you to spend more time fishing around for little things buried inside. It also means that, if you don’t fill the bag entirely, your items will jostle around more than they would in a bag with several smaller pockets. The front pocket and the two interior pockets in the main space can only do so much, and I had trouble digging out keys and pens when they’d fallen to the bottom of the well. I was impressed by the strength of the magnetic clasps, but they slowed me down. Undoing the clasps, flipping the flap, uncinching the top, and getting to your stuff takes a good few seconds longer than a traditional zippered compartment or plastic buckle would require. And despite their strength once fastened, the magnets aren’t all that easy to clasp. Sure, magnets might be faster than those purely cosmetic buckles, but I can unload a zippered bag much faster. The interior is full of little details hidden from the sight of all but the owner, thus adding to the sense that you’re in on the brand’s great secret. At the lip of the laptop sleeve there’s a stitched cursive “Welcome to Herschel”—the clearest sign that you’re buying into something resembling a movement. The undersides of flaps and the main pocket interior are lined in a bright red pinstripe. This feature crops up in a large number of Herschel products: The brand says the “heritage striped liner” is a nod to the striped engineer’s overalls that could once be seen in the mills of Herschel, Sask. The reference may be pleasing to some; I found it a little garish, especially on a black bag. Every time I forgot to cinch the compartment closed, a bit of candy-stripe would stick out around the flap, making the bag look more clownish than serious. Although the Little America comes in cotton, nylon, or a coated fabric, the best-selling version is 100 percent polyester, so it’s not really water resistant. I threw some water at mine, and it held up fine, but after bolting through a downpour with it, I had to yank my MacBook out in a hurry. The craftsmanship also leaves something to be desired. According to the backpack experts at Carryology, Herschel has taken care of the quality issues that marred its early days, such as faulty straps produced by subpar manufacturers. Nevertheless, I was surprised to find the stitching on my bag starting to fray—inside the lining, underneath one of the buckles—after just two or three weeks of use. But throughout the time I’ve used the Little America, what’s fascinated me the most is what the retro backpack trend means, and how Herschel has so expertly capitalized on that meaning. This pursuit of “heritage” in a product is fundamentally about authenticity. In a sea of the arch and the ironized, the hipster seeks out the cool, hard mooring of some lasting truth—and that usually means reaching back in time to retrieve it. When I look at those faux-leather straps, I start to imagine scouting trips in an American boyhood long since disappeared. I imagine photographs of myself in a simpler, happier time that looks oddly like the 1970s. It is the shrewd achievement of Herschel that it can deliver this nostalgia through a mass-produced contemporary fashion product. With the Herschel on my shoulders, I did have moments of feeling rugged and chic, all at the same time. But those moments were brief, usually interrupted by the sight of a person directly in front of me on the train or the sidewalk, wearing the exact same bag. Ultimately, Herschel comes wrapped in a lovely myth. But there are disappointments in the bag’s utility, its design, and its manufacturing. The Little America sets up an illusion that it’s hardier than it really is; the bag, like the Herschel story, is a bit of a clever fiction. If you buy one, keep in mind that you’re buying the story more than a rugged reality. It’s a great item for a season, but less of an investment in your backpack-wearing future.